Resource designed for younger children with autism spectrum conditions, typically between the ages of two and eight, provides activities that emphasizes foundation skills such as social referencing, regulating behavior, conversational reciprocity and synchronized actions. 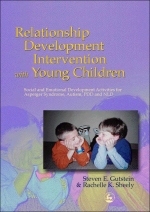 The authors include many objectives to plan and evaluate a child's progress, each one related to a specific exercise. Suitable for parental use, the manual is also designed for easy implementation in schools and in therapeutic settings.